I have been meaning to write this blog post for quite a while and I’ve gotten a little behind on the blog! Photography is an art, is subjective, and is something that I knew I always had inside of me but never knew how much passion I had. I have the typical story that most photographers do – I fell in love with photography and started to photograph families, and from there my passion grew to where I am today. I have been self-taught and I am really enjoying this thing called life and the creative pieces of me that I’ve found. My parents were interested in photography before I was born and they would photograph each other and develop their images in a dark room. I have several of these photos to this day, and I believe it helps me learn a little more about my family. The feelings that photography evokes is something unique to each family and even the photographs taken of the family. I’ve written a blog post called 3 reasons why I am a lifestyle photographer so I encourage you to take a read to learn a little more about by background. In order to become better at anything, you really need to study and learn and observe and network and really find ways to hone in on your craft. And it can be a LOT to navigate and honestly a little overwhelming. What has really helped me is finding photographers that I gravitate towards, and essentially looking up to them as inspiration. I don’t mean copying their work, but simply admiring their art and how it unfolds. I always knew I loved “candid” photography and I was quite excited to find out this thing called lifestyle photography. It’s actually quite popular. It infuses family dynamics by using light posing and direction and being able to tell a story through the images and the feeling the images create. Lifestyle photography is a little more posed than documentary photography, but the goal is to allow the families to infuse their personal style into the session, resulting in beautiful images. I’ve put together a list of a few photographers that really inspire me. Be sure to check out their work and you’ll be so happy you did! This is a part 1 list and there are several more lifestyle family photographers that inspire me and deserve to be recognized for sure! 5 inspiring lifestyle family photographers to check out! I don’t remember to be honest how I came across Elena’s work, but I don’t know where I would be had I not taken the time to invest in her amazing education. She is a lifestyle family photographer and I can’t get enough of her maternity, newborn and family work. She is one of the most humble and transparent photographers I’ve come across, and I have purchased several educational materials from her. She truly loves to help fellow photographers, believes in community over competition, and her work is so inspiring. She has taught me that photography doesn’t have to be perfect. For so long I would over critique my work because it wasn’t “technically correct” but I learned to dig deep into myself and my passion and learn what art means to me, and I believe through some of her education I was able to reach my “why”. If you are ever in the Seattle area, definitely reach out to her. I hope she comes back to Atlanta soon and hope to meet her in person one day! I have been following Sara for quite a while on Instagram and let me tell you - her feed is BEAUTIFUL! She is in the Oakland area and I so badly would definitely reach out to her for a family session! To me, her work is somewhere between documentary and lifestyle and she is so talented with her composition and how she wants to tell the story in the frame. She is so amazing at focusing on those details that you otherwise wouldn’t consider being important - the pigtails, the kisses, the newborn feet, and the way the little guy lines up his trains are all images I think of when I think of her work. I love that her work is also colorful and it’s really inspiring to me because I love color! Check her out! One thing I love about Kati's work is the way she focuses on connection. Immediately you can see in the image below how she delicately framed this image to tell the story of a mama and her baby, in those moments we knew flee so fast. She specializes in Fresh 48, Newborn, Family and Maternity Sessions so there is definitely something for every family, no matter their stage. Her family work is told in the most unique places, and I am really loving the urban locations! Her newborn work is so amazing, connected, beautiful and helps to focus on the special moments of the family. Check out more of her work here! Tricia is based in Cleveland, Ohio and you definitely need to check her out! 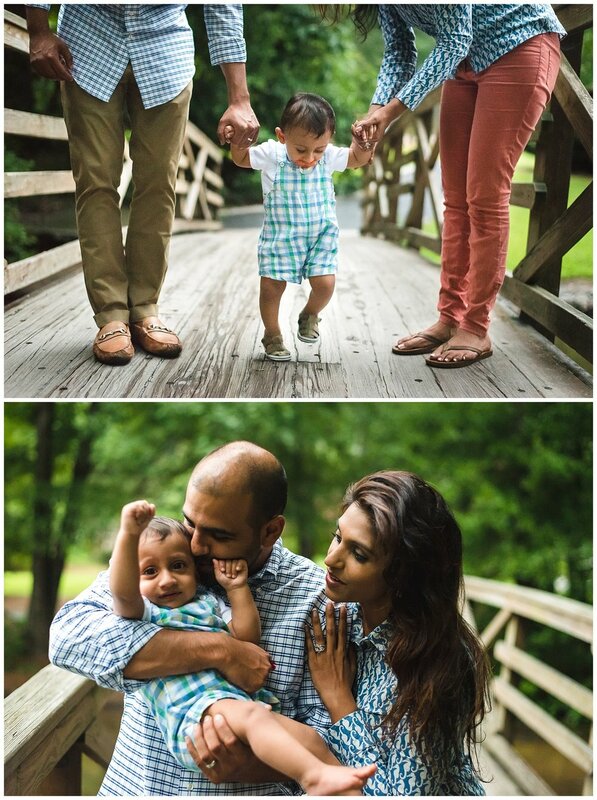 She has a beautiful style and an amazing talent at using light to enhance the image of the family. Her sessions look like a blast and I know the families are definitely happy with their images. I am excited to continue being inspired by her beautiful images of children, families, and newborns. Head on over to see more of her work here! I actually found Kate in a Facebook group that I belong to and I was absolutely in love with her work! I spent some time on her website and learned she also mentors photographers in several capacities! I had a mentoring Skype session with her last summer and she was amazing to work with! Her work is super colorful, cheery, beautiful, and she finds the best places in Boston for a family session. She is so bubbly and genuine and I love seeing her travels in my Instagram feed! She truly believes in the power of storytelling and printing your work and I wholeheartedly believe the same! Print your digitals and frame them in your home. Choose an album and show it off to your friends and family! I hope you enjoyed reading some of the ways I have learned from the photographers I just mentioned. It’s such a good feeling when you can be inspired by other people’s work and it helps get closer to your why. I can’t wait to continue seeing more of their work! After having a baby I’m sure the last thing you want to do is get in the car and drive to a session. The great thing about Fresh 48 Sessions is that I come to you! Whether you are in a hospital or at home, there is no need for you to travel! Part of these storytelling sessions is documenting all of the chaos going on once your baby arrives. If you are in the hospital, I will incorporate all of those hospital bracelets, baby blankets, hats, and even the gown to really tell the story. We will use different areas of the hospital room (yes, that’s possible!) mainly with window light to make sure there is enough available light for you and your family to be photographed. The hospital room, windows, and even the hallways will all be perfect for your Fresh 48 backdrop. There is no need for you to travel and all of these will help to tell the story of your baby’s arrival. If you plan on having your baby at home, I would love to incorporate your bedroom and other environmental elements from your very own home. Your baby is growing so fast! She will look so different in the first few hours and days and you might forget the way she looked laying in her bassinet, or how little those bracelets were that she wore on her wrist and ankles! There will be so much going on, so I want you to relax and be in the moment and I’m there to be a fly on the wall to get those details that will mean a lot to you down the road. You and your family will be completely in love with your baby as soon as he or she is born. One thing I love about Fresh 48 Sessions is being able to take a photo and include all of the family members. Many family photos that I take during Fresh 48 sessions are candid and documentary, however, I always aim to get a family portrait with everyone looking at the camera. We do live in the age of cell phones and selfies, which are great for those snapshots but sometimes it can be tricky to get a good family photo when you are taking it yourself! Relax and let me do the work for you. 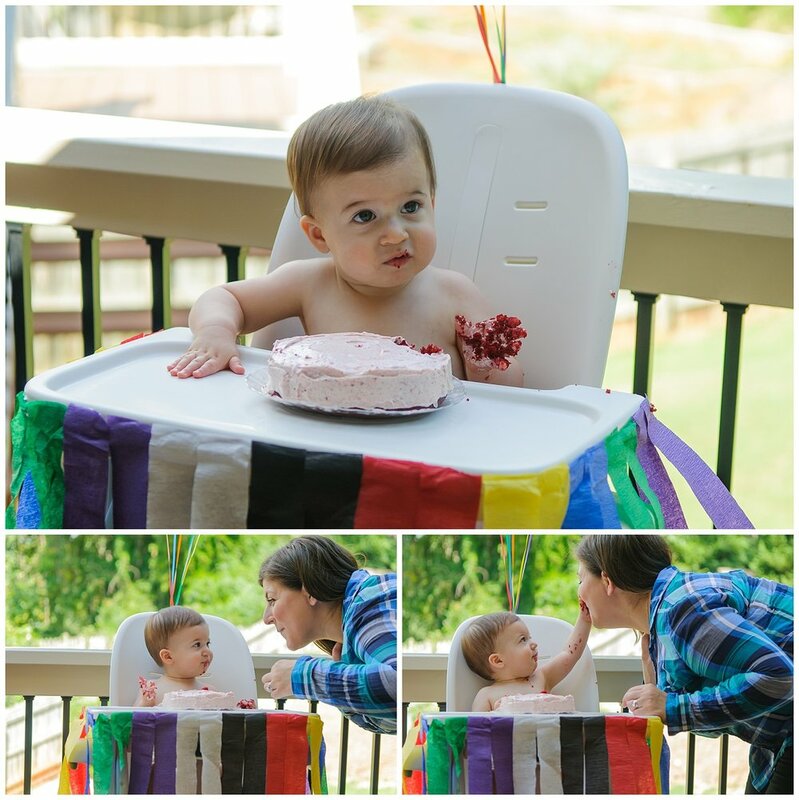 I really want these photos to be special for you to remember your baby’s first few hours. Convinced that you would love to have these first few moments captured? Please fill out my contact form and send me a message and we will get your family scheduled! Have you ever wondered what to wear to your family session? You are not the only one! When you’ve got family pictures scheduled not only are you trying to pick the best time and get all of the family members excited about the family session, but you also want to look great in the photos. There is not much I recommend not wearing to your family shoot so I’ll mainly focus on what you can wear! First and foremost, if you don’t feel comfortable you won’t look comfortable! Try picking out clothing that you would normally wear when you are with your family. I mostly photograph connection and engagement and this includes movement with families. I would encourage you to look in your closet and find something that allows you to move in comfortably. Mom, this can mean that you find an outfit that most flatters you and makes you look beautiful. This can be a cute top and jeans, or it can be a maxi dress that allows you to bend down with the littles and be able to move freely. Once you’ve done that, gather some outfits of the rest of your family that will compliment your outfit. Dad, dress in something you’re comfortable such as a button down or Henley top and jeans. I would recommend avoiding sneakers and flip flips, and rather closed toed shoes that compliment your outfit. There are so many stylish outfits and clothing options these days so it’s helpful that what your family wears allows you to compliment one another and not be too “matchy matchy”. If you normally don’t go out wearing identical outfits let’s not do that for family photos. This isn’t the decade that we all want to wear the exact same white top and khaki pants. Just don’t do it. We want to show uniqueness and personality! Take a look in your home and you may notice that you are a family that gravitates towards neutrals, or you may be a family that likes pops of color. Whatever your style, think about that when you are getting everyone dressed. In the spring feel free to wear lighter colored clothing, with colors that compliment one another and go together. In the fall it could be darker colors such as navy blue, magenta, mustard yellow, and blacks. Still aren’t sure? Feel free to check out my Pinterest Board and look up a color wheel to see which colors can help go together and compliment one another. This can be a necklace or scarf or can be a light sweater. If your family members are wearing mainly solid colors, feel free to put one of your family members in a patterned shirt to mix it up. You can all still match one another even if you are mixing up the colors and textures of your outfits. We want your family photos to be timeless and sometimes having large logos and graphics on clothing can be distracting. Try to stay away from having large print or dated photos on your clothing. I would also encourage you away from wearing neon colors. There may be a time and place for neon clothing, but typically it isn’t the best for family photos and you will have a hard time making everyone’s outfits go together for family photos. The neons usually don’t photograph as well. 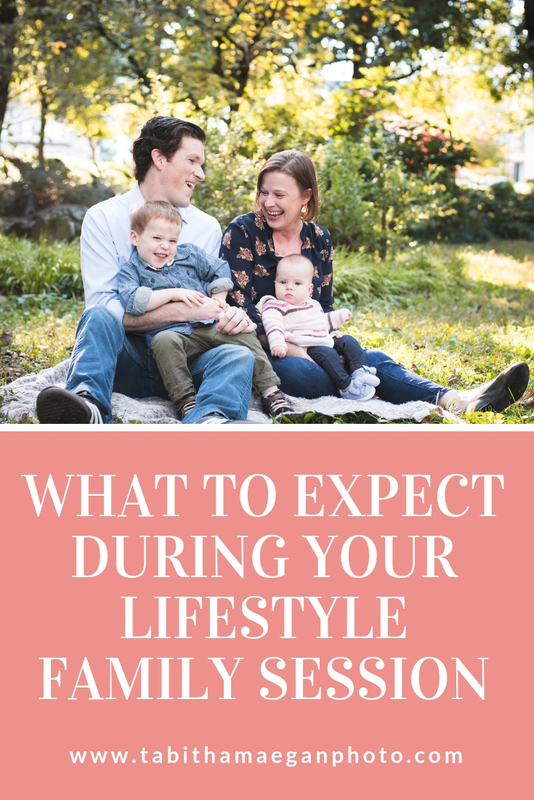 I hope this guide was helpful for planning your next family session. Please check out more photos from my family portfolio so you can know what to expect during our session. I also have a link to my contact form where we can chat about booking your next family session. I can’t wait to hear from you! Since you’re here on page I will guess that you are either interested in learning more about me as an artist and photographer or maybe you like my work and you are interested to book a family session. I have written a little blog post that may help you get to know me. As a photographer it can be easy to hide behind our camera and focus on other people but families are most comfortable with photographers they know! I’d love you to hang around for a few minutes to read 5 things you might not know about me, and head on over to my contact page if you like what you see and you are interested in booking a family session! I’d love to meet you! There is something about people that really interests me. There’s actually quite a lot about people that interests me. Human behavior and connection are probably two of the things I enjoyed most throughout school. I would always get the best grades in psychology classes because that’s what I was motivated to learn. I incorporate connection in my work and you’ll see it in my lifestyle family sessions. I always want to make sure people are connected and I think it helps to tell your family’s story. The human behavior piece definitely fits into my photography style and I make the effort to pay attention to family dynamics as well as the attention span of the little ones. If the little guy would rather go collect sticks, chances are I will tell his brother, Mom or Dad to follow him and see what happens. Likely we can follow the child’s lead for a little while and get genuine expressions in the moment rather than forcing a pose. I’m serious! Is that weird?? Is anyone else right handed and wish they were left handed? I used to practice writing with my left hand on many many occasions just so I could improve my handwriting. Let me tell ya something – I’m actually pretty good at it! I always wanted to be left-handed. I’m sure it’s not too late! I don’t know if it’s because it’s less common and it’s like a, “you’re left handed?” thing, but it’s just something that I always thought was so cool! I guess we want what we don’t have, isn’t that right? One might think that a food blog and family photography have nothing in common, but my passion for photography is what holds those two things together. My work might not ever be in a food magazine or on TV, but I have so much fun creating a photograph that makes a dish look appealing. Not to mention eating the food. I mean, helloooooo I LOVE TO EAT! Although I do the grocery shopping, cooking, photographing, and eating, I do wish that someone could come behind me and clean the dishes. I am NOT a fan of washing dishes. But I can put that aside because working on my food blog is still so much fun! Head on over to Tabitha Talks Food to check out my work! You will find easy to make, delicious recipes that keep my heart and tummy full and happy. In this blog post I mentioned that my mom would photograph our family to send to my dad when he was away on the ship. You can start to see how my love for photography began! I was born on a navy base in the Philippines and we lived there for a few months when I was a baby. It was pretty neat that my Dad was stationed there because my mom’s side of the family is also Filipino and Spanish. I went back when I was in college and it was such an interesting experience that I don’t know I’ll ever get the chance to do again. I was there for about a week and I think I seriously photographed everything I encountered! I also tried almost all of the food that was in front of me! Finding Filipino food is such a rarity here in Georgia so when I am craving Filipino food I’ll head into the kitchen and make a few dishes. After leaving the Philippines when I was a baby, we moved to California for a few years. When I was six years old we packed up all our bags (who am I kidding, I probably didn’t help at all packing) and drove across the country to Atlanta, Georgia. I went to elementary, middle, and high school here. When I was applying for colleges I didn’t apply out of state and I ended up going to school in the city. Most people move away from home for a job or school, but I actually have been here since I was a child. If I were to move I’m sure it would be a great experience but Atlanta is my home! Now that you’ve learned some things about me, I’d love to learn something about you! Leave a comment below with something you’d like me to know about you. I’d love to tell your family’s story so take a look at my family portfolio and see if we would be a good fit for a lifestyle family session! When I am thinking about my reasons for being a photographer I like to think about my “why”. I like to reflect about what it is that pushes and guides me to be a photographer and what I hope to accomplish each time I pick up my camera for a session. Keep reading to learn a bit about my style of photography and what drives my passion. When I was young, my Dad was in the military and would leave for several months at a time. My mom took photos and videos of our family and little things that made our family special. This could be anything from photographing the way we played on our swing set or showing off our new clothes and toys to show my Dad. All of these photos tell a story. When I would go to my grandfather’s house in California I used to make it a point to sit in his living room and pick at least two or three photo albums at a time to look through. He would look through them with me and laugh so hard that he couldn’t even tell me the story about the photo. He recently passed away but I will always cherish the moments and the stories told through photography. Photography gave me a way to learn about his life from several years ago, and gave me a way to also learn about my mom and her siblings. He actually told me that if it weren’t for my grandmother he wouldn’t have any of those photos of the family or his children. It’s so nice to be able to get closer with friends and family members over something that seems so insignificant but is actually very important. Situations, families, jobs, and experiences can be so different several years from now and being able to use a camera to document the moment and memory is a way to help tell the story. It might be hard to remember how your daughter looked and felt when she lost her first tooth. And you may want to look back at that silly face your son made when Daddy held him close. Sometimes photographs can tell a story without words and I try to incorporate that every time I press the shutter. This relates to telling a story and really captures the moment in time. Take the time to think about what memories of your child you have and what you want to be sure to document and not forget. A good example of documenting memories is photographing your new baby during a lifestyle newborn session. You might not remember how little her toes were or what kind of blanket she loved being swaddled in, but it’s important to have those photographs to look back on. Maybe your little girl is teething and makes a funny face with a little bit of drool. That’s okay! More than likely I wouldn’t edit that out of my photo, it stays in to tell a story and document the memory! What I want to show in my lifestyle work is the viewer to be able to see the connection and the love. I do try to make sure everyone looks and feels comfortable, however I don’t want to take away from the family’s connection. I prefer connection over perfection any day. I don’t fix my hair to be perfect every day and 90% of the time my nails aren’t manicured or painted. Half of the time my socks are mismatched. It is interesting to see how my personal feelings are embedded in my work. I love the documentary aspect of lifestyle photography and the way the details show life and don’t focus on perfection. There is always a time and place for perfection but I hope to be able to provide the means to tell your story in a way that is specific and tailored to your family what is important to you right now. Sometimes your child would rather look at you and sing than look at my camera. Sometimes your child wants to read a book with you and would rather read than sit on a couch for a stiff family photo. And I’m okay with that. It’s connection. And I can’t wait to meet you! I’d love to photograph your family for a lifestyle family session. Check out my family portfolio here and send me a message on my contact form about how we can schedule your family session! When you plan your maternity session you have the option to think about the best place for your “backdrop”. What I love about in home maternity sessions is the personalized feel of the session. The baby isn’t here yet, but it doesn’t mean we shouldn’t take some time to document this new place where he or she will be spending most of their time. I’ve put together a shot list below of how you can get the most of your in home maternity session. I have a wide-angle lens and I think it comes in most handy for getting a wide view of the nursery elements from wall to wall. You can see from a distance all of the hard work that’s been put into decorating the nursery and I love starting my maternity and newborn sessions with a wide angle view. Helloooo Mama, you’ve got a belly so you need to show it loud and proud! Wear something comfortable that allows you to move around, but also hugs your belly to show it off! One of the reasons I love being a lifestyle photographer is being able to tell a story using photography. Be sure to get a mix of maternity photos by yourself but also include your significant other and your children! Can we just take a second to talk about this wall? It’s amazing! When you see areas in the home that you want to incorporate into the photos, totally do it! I knew I needed to get this wall and all of the hard work that was put into designing it! Sometimes family members and friends will give gifts to the baby. This can mean a hand made blanket, a photo frame, or a special book. Look for unique ways to incorporate this in your maternity session. Bonus points if you incorporate a book written by Jimmy Fallon. Love him! During this in home maternity session we walked into the master room and I was immediately blown away. First of all, my love for all things floral automatically triggered me to take some photos on the bed. It’s gorgeous! 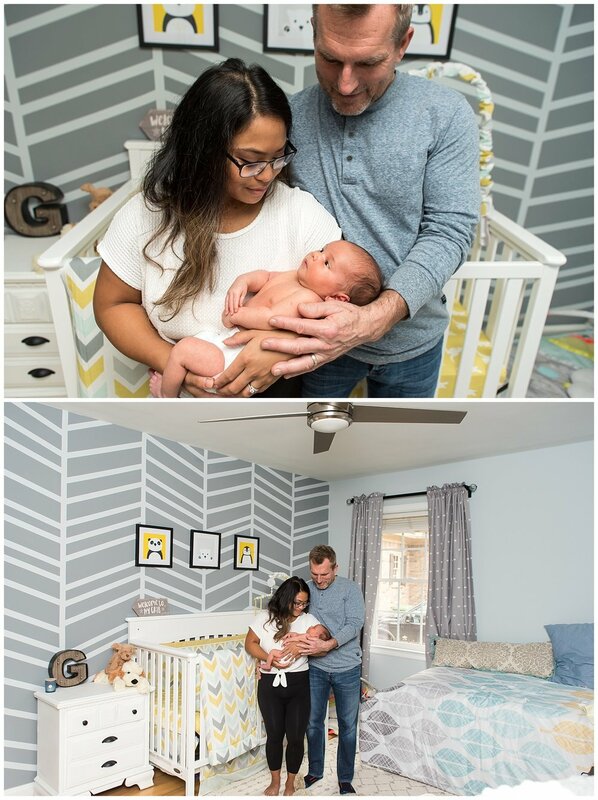 I like that the master bedroom gives a personal feel and I incorporate the master room in not only in home maternity sessions, but also in home newborn sessions. For homes that have fun walls or furniture I always look for ways to also add those to the photos. This chair was crying out to be photographed! Mom had an idea to use this chair in her bedroom and it contrasted so nicely with her dress! My very next thing! When you get your maternity photos taken, think about how you will feel the most comfortable and gorgeous. After all, you’ve got the pregnancy glow! This dress matched really all of the different places we photographed at this maternity session. Pets are part of your family so why not make them part of your family photos? It took just a few minutes to calm them down to focus and sit still enough for the photos but I think it was sooo worth it! I’ve photographed with both cats and dogs and love the dynamic it adds to the family photos! When you put so much time and effort into the nursery it can be easy to forget to focus on the details. 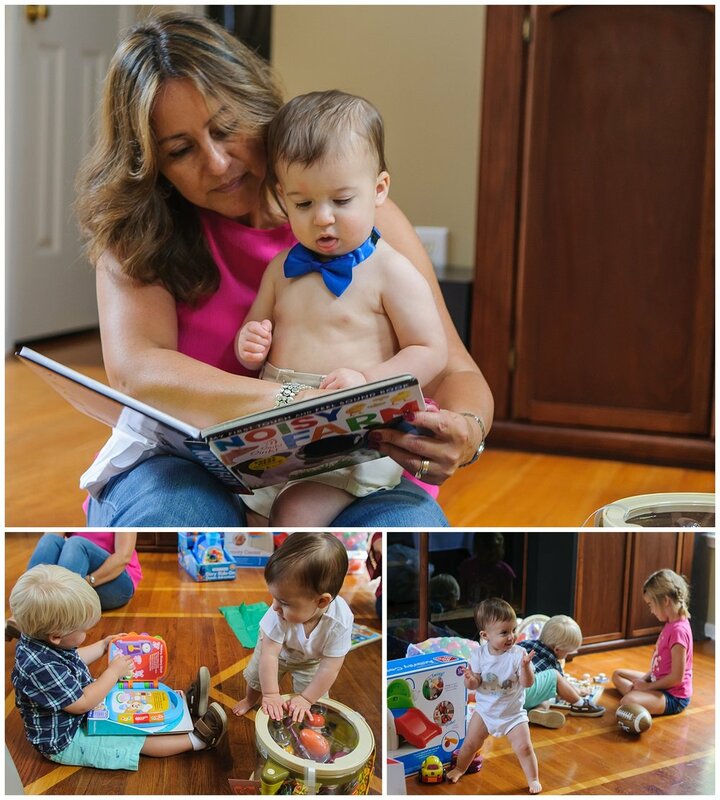 Take a few minutes to photograph the small stuffed animals, the books, the changing table, and anything else that is special to you. Check out the maternity gallery for more of my work. If you are interested in booking a lifestyle session, head on over to my contact page and we will be in touch! When you book me for your lifestyle newborn session, the last thing I want to happen is to add stress. I actually want the opposite and want you to have a relaxed newborn session! You’ve just had a baby that has maybe been home for a week or two. You might have a toddler sibling that is still getting used to the routine and that there is this crying baby that doesn’t know how to control their voice or emotions. Maybe it’s your first child and you want to have this special time documented and want to be in the photos too. 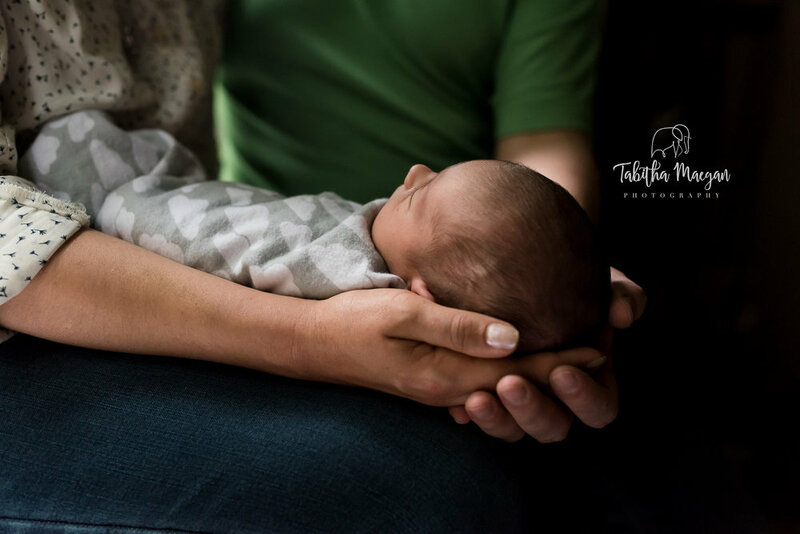 I am excited to share with you a few things we can do for a relaxed newborn session. When you are preparing to have your new baby, you are also preparing the baby’s nursery. I’ve come across so many really amazing nurseries that have had so much time and energy put into them to look special. This can include special toys or handmade items from family members and friends, it can include a special theme, and it can also include special photos of family. With the wide range of what can be included in a nursery, I think it’s really important to make sure to capture the details, and I can’t leave the nursery details off the list. Capturing the details also means making sure you know how small your child is in his or her nursery, or the way they stretch when they are getting out of the swaddle. And of course, getting detail shots of the baby’s hands, feet, and their head of hair. 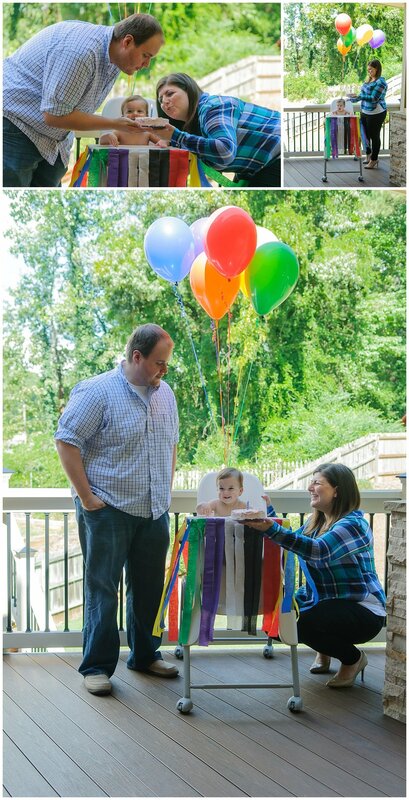 We know during our lifestyle newborn session we want photos. We want a photo of your new baby in her new dress or his new outfit. We know we want family members, and we know we want to document this special time. One thing that holds us back a little bit with our agenda is that the baby will do what he or she wants to do, when they want to do it. We can’t rush! We have to be able to go with the flow. Newborn babies need to be fed, they need to be changed, and they get cold. They are still figuring out this world and how to communicate. That is totally fine! We don’t want to rush these newborn sessions because they are lifestyle in nature. I like to allocate about two hours for newborn shoots which gives us enough time for the breaks. When these things naturally happen, I am there to photograph them! I am kind of already saying this as I’m thinking about how to be relaxed for your newborn session, we also have to be flexible. We might think that we are going to change the baby into his new outfit and realize he had another idea and needs to be soothed and settled before trying to put him into this outfit that he doesn’t really care about. What I like to do at this time is continue chatting with the family. If there are siblings, I like to spend time with them and get them engaged in an activity. Maybe big sister wants to show me her new bedspread in her room. I’m going to follow her and take some photos while I’m in there! We definitely have a plan to have this lifestyle newborn session but sometimes things happen and being flexible will definitely help to be more relaxed at what can be this crazy time of your life! Think you might be interested in booking a lifestyle newborn session? Check out my newborn portfolio and then send me a message on my contact form and we will get your session scheduled! When potential clients reach out to me about booking a family session I get really excited! I get excited to get to know the family and what makes their family special. People typically book a family photographer once a year at certain times, whether it’s the spring, the holidays, or to celebrate a new addition to the family. Or maybe the family books sessions through out the year. I want to get to know the families briefly on the phone, learn everyone’s names, and learn about what the children like to do. It is also important to know how their children typically behave in front of the camera. Some children really love the camera and others might not want anything to do with me. It is always helpful to know this information ahead of time so I can be a match to the family’s goals and expectations of their family session. Once I am able to gather details from the family that will help me capture the connection and tell a story through images, I mention to them what to expect. 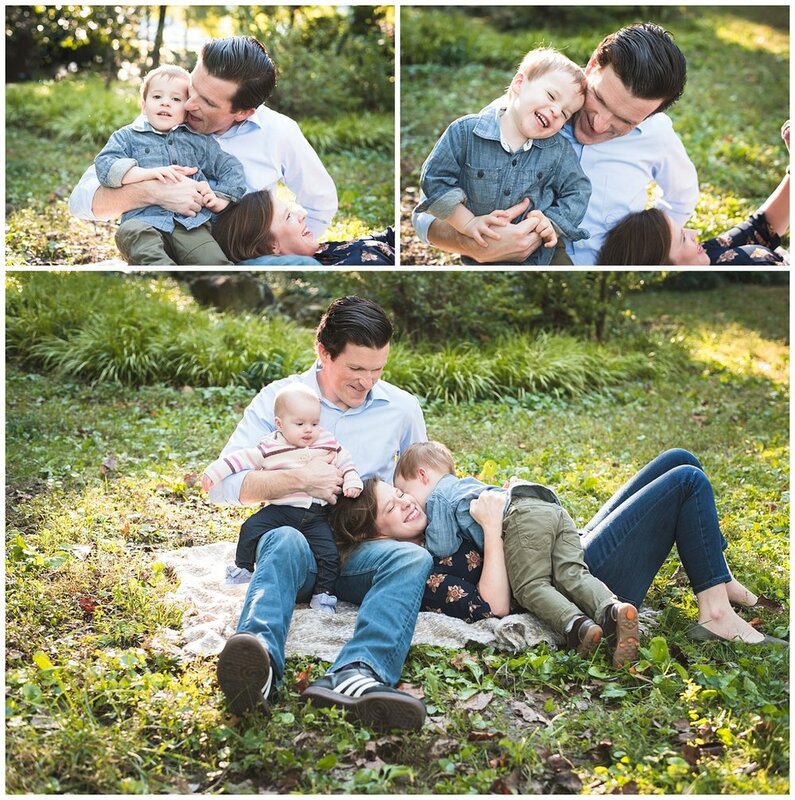 Here a few things that I aim to do during your family session. First and foremost, getting your photos should be fun! I know it can be stressful to figure out what to wear, or figure out the best location for your family, but hopefully I can take the stress out of that for you and share ideas for What to Wear. Aside from that, clothing doesn’t really matter. What matters is that your family has fun. Have fun! This family had two young children, that at times were interested in the camera and other times didn’t really care that much. It’s important that I keep your family close together while you keep your children engaged in fun! This can mean tickling your little guy, or seeing how he can pile up and hug on Mommy. 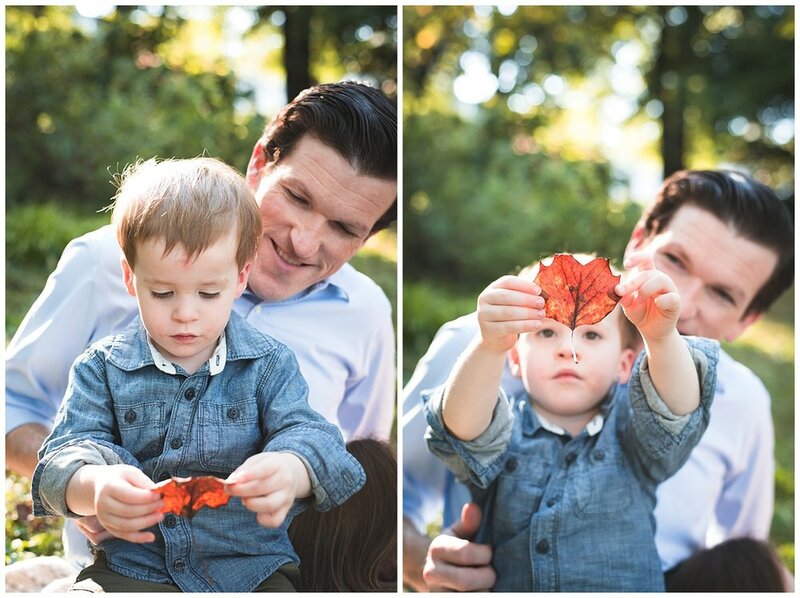 It can also mean allowing your little guy to play with leaves and talk about the color or shape! Or maybe your little girl just wants to he held. I’m there to document that for you! Once we get the important shots out of the way, you know, the ones for the grandparents with everyone looking at the camera, we can relax a little bit. 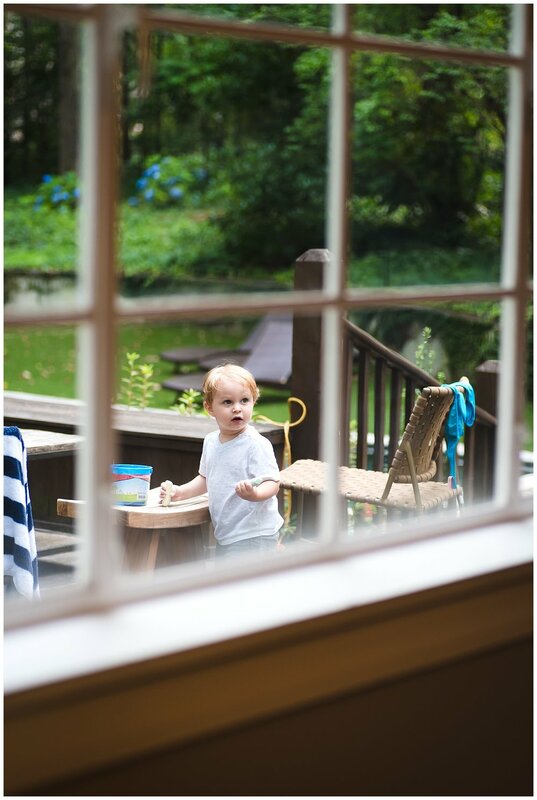 My favorite images are always the ones where we allow the child to naturally explore and get into something he or she wants to do. When we let the child lead the way, they will naturally be motivated to interact and play, and this helps to bring out natural expressions from the child as well. This little guy would stick with us for a few shots and then wanted to explore nature. He wanted to collect leaves big and small, and he wanted to look at the little bugs crawling on the stone. It was totally fine, we are at a park! Let’s have fun and allow me document your child’s interest at this age. Let’s let them lead the way! Sometimes if your child doesn’t really show interest or maybe there is something that you know he or she will like, we can plan an activity. I was actually photographing Mama and baby girl for a little while when I glanced over and saw this little guy exploring the rocks and the water. Dad was already there supervising for safety so I encouraged Dad to stay close to the little guy and just be with him and that I would photograph them. And that’s exactly what happened. I didn’t need to set up this activity, it was already going with the two of them. You can see how engaged they were in this activity to find the bugs and look at the water. We didn’t really know this ahead of time or before the session that the child would be interested in just that, but the activity naturally unfolded. I love the way they are together and enjoying what they are doing. I can’t wait to meet your family and take unique photos that help to tell your family’s story. Check out more images in the family gallery. If you think you may be interested in booking a session, please say hello on this contact form and we can chat! I love love love lifestyle newborn sessions. Being a lifestyle photographer means helping to tell a family’s story and incorporating meaning and emotion into the image from the session. Looking through my last few newborn sessions I realized there are some important detail shots that I tend to take that help to document the special time of welcoming a new baby into the world. Here are 10 ways to use photography to help tell a story during your in home newborn session. Sometimes Dad’s aren’t particularly jumping to the opportunity to get their photo taken. I like to take a few photos of the entire family at the beginning of the session and then let Dad be on his way. While I still have Dad’s attention and the family is still together, I like to crop in tight to get a shot of the baby. This might mean moving the family around a little bit, but it’s a nice way to create variety within a family shot. The baby was awake for almost this entire session and I love this photo with her eyes open. I don’t think I could have a newborn photo shoot without photographing the baby’s feet! The baby is so precious and new and getting close up photos of the baby’s legs and feet is so important. They grow so fast at this age so make sure you don’t forget that detail shot! The master bedroom in this home had really great window light. Most of my sessions are taken with natural light when possible, and for those sessions I like to take some photos near a window. My focus is more on the baby and the family so it doesn’t bother me when the windows are blown out. I typically like to schedule my newborn sessions when the newborn is 2-3 weeks old because the babies are more alert. When they are awake it tends to be a little easier to capture connection. Whether you are photographing the baby’s connection with the family or with the viewer, it can be a nice way to tell a story. For rooms and space that allow, I like to step back and take the photo that allows the viewer to “peek in”. 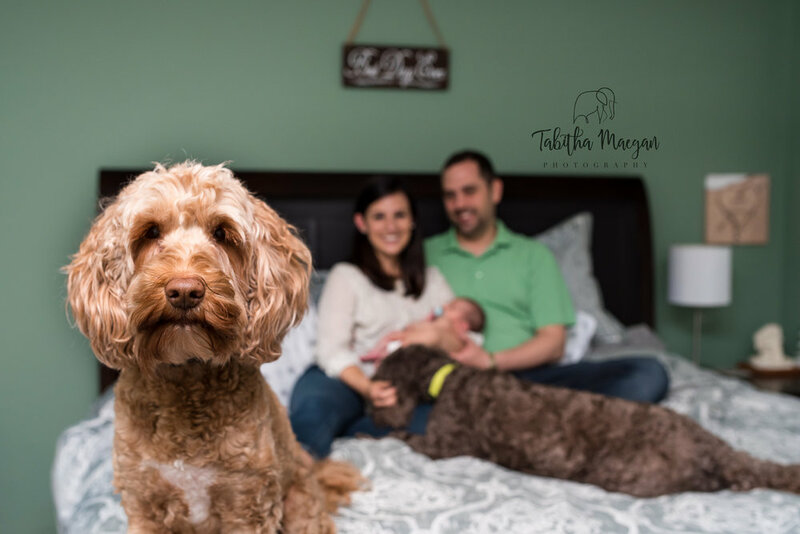 I couldn’t have asked for a more perfect way for the family dog to join the photo. When taking these peeking-in shots, you can frame the shot with the door and/or crib if the room allows. When Moms are comfortable being photographed nursing their babies it gives me an opportunity to walk around from different angles and document this special time. Newborns naturally eat often so don’t be afraid bring your camera and document a few of these photos for the family to enjoy. This photo can be taken with the baby in their crib awake or sleeping and I think it helps to tell the story because this is where the baby spends so much of their time. Photographing the parents looking at their baby in the crib is another idea to tell the story with a different perspective and creates connection between the parent and the baby. Another thing you can do is have the parents put their hand on the baby. Babies are so small so I always like to incorporate objects, furniture, and people in comparison to document their small size. Placing the baby on a clean bed and photographing them from different angles is another way to tell the story. This one allows you to compare the size of the baby and remember what they felt like. If you’ve had photos taken of your newborn, did you get any of these photos? If you’re a photographer would you add anything else to this list? So it’s your baby’s first Christmas and you want to take family photos. Now what? Whether your baby is an infant, sitter or toddler, I’ve listed out 6 photo ideas for your baby’s first Christmas. If you’d like ideas about how to incorporate holiday items and family members that add to your family’s Christmas photo session, keep reading below! The master bedroom in this home had quite a bit of natural light so we took advantage. We sat the baby on the bed and faced him towards the window. This helped to illuminate him and create catch lights in his eyes. I also loved that the bedding was simple so it naturally allows the focus to be on him! It wouldn’t be a Christmas photo shoot without some holiday items! I suggest keeping it simple for the shots with the baby. I love a naked baby because you get to see their adorable little body and chunky baby fat! Mom and Dad had some Christmas socks and a hat they wanted to incorporate so we decided to keep it simple so that the focus could be on the little guy and his first Christmas! Mom had the idea to use the Christmas lights and I loved how they turned out! Little ones love putting things in their mouth so you’ll want to be a little close to them just in case they decide it’s a fun toy to put in their mouth. When you plug in the Christmas lights it be easier if you turn off the overhead light. This will help to create the natural look that isn’t too bright. Keep in mind these Christmas lights can get hot if plugged in for an extended amount of time so I would take as many shots as you can before the lights get too warm for baby. Of course it’s the baby’s first Christmas but we also want to document this special time with Mom and Dad! You can get creative with these. If there is a tradition a family has during the holidays such as kissing under the mistletoe, feel free to incorporate that into a family photo! I typically wouldn’t suggest everyone wearing the exact same thing during a typical non-holiday family session, but with this being a Christmas theme, we can’t forget Christmas clothes! I just loved how adorable they are with their Christmas jammies. I might have to shop around this year just to have a photo like this! Pets are part of the family! Mom and Dad had this pup before the baby was born so it would be unfair to not include him in the family photos. I just love the pup’s reaction in the photos. Can you tell he is excited? If you have any ideas about how to create fun and unique holiday family photos, I’d love to read your ideas below! When we think portraits we might often think studio or a close up headshot. Here I have listed 10 ways you can incorporate several backgrounds, poses, and props to add variety in your lifestyle portrait session. Let's get started! Typically when you get your subjects moving, they relax. When people relax they are usually more photogenic and this results in a fun and interesting portrait. If you are photographing your subject in a flowy dress, try to have her twirl in her dress. It might sound silly but it can make for a great photo! You can also create movement with hair. Here she just started shaking around her hair and I snapped away. The photos are so fun! I love putting my subjects in front of unique backgrounds. This could mean putting them in front of a brick wall, a staircase, or a fun window. Take a look around your environment and see what kinds of areas that would make your subject pop. Keep in mind what your subject is wearing and make sure their outfit can compliment the background. Simple backgrounds are also great for photos! Again, keep in mind what your subject is wearing to make sure the outfit and background compliment each other. It might be a good idea to ask your client what they will be using the photos for. If your client wants a portrait with a simple background, try to look around for a space with few distractions and a clean wall. One way you can learn about someone is photographing them in their natural environment. Taking photos in your home can add a personal feel to the photo. Whether you are a food photographer or a family photographer using your natural environment helps to create a warm photo. I like to get a few close-up shots during my lifestyle portrait sessions because it keeps the focus clear on the person. I like to shoot a little elevated from where they are standing and this helps to give you a variety of perspectives from the same pose. If you are a coffee drinker, experiment with having the coffee as a prop in your photo. These types of photos have more of a blogger style but I feel that it helps to add a personal touch to the photo. I also like to take photos of photographer friends with and without their camera. Holding a camera (or a coffee in the previous example) gives your subject something to do with their hands and relaxes them. And like mentioned earlier when people are relaxed they are photogenic! This is another way you can give your client something to do with their hands. Have them run their finger through their hair or stroke along their face and will naturally give them a way to create interesting elements in the photo. Using a chair can be another way to incorporate a prop into a photo and keep the photo and the subject looking natural. A chair can add interesting dynamics to a photo and will give you variety of looks within your gallery. One of the jobs of being a photographer is interacting with the people you are photographing. Don’t forget to take some photos of them laughing! You will want to engage with them, bring out natural expressions, and relax them. It can be hard to act natural in front of a camera so when you are talking with your subject, make sure to capture the moment they make a candid and genuine expression! Some of my favorite photos of myself are ones where I’m laughing because it’s not a super posed expression! Most of the lifestyle portraits I take include the environment, background, props, outfits, and other elements. It might be helpful to take a couple of close up shots that allow your subject to fill the frame and be the focus in the photo. Do you have any other tips that should be included in this list? I love when families come back for their sessions! I have been lucky enough to photograph Krishan at his lifestyle newborn session and again at his 6 months lifestyle session. Each time I see him he has gotten cuter and cuter and is doing all kinds of new things! His recent milestone s pulling himself up to stand and scaring Mommy and Daddy. He has the most adorable smile and he melts my heart every time. And can we just talk about his outfits?? 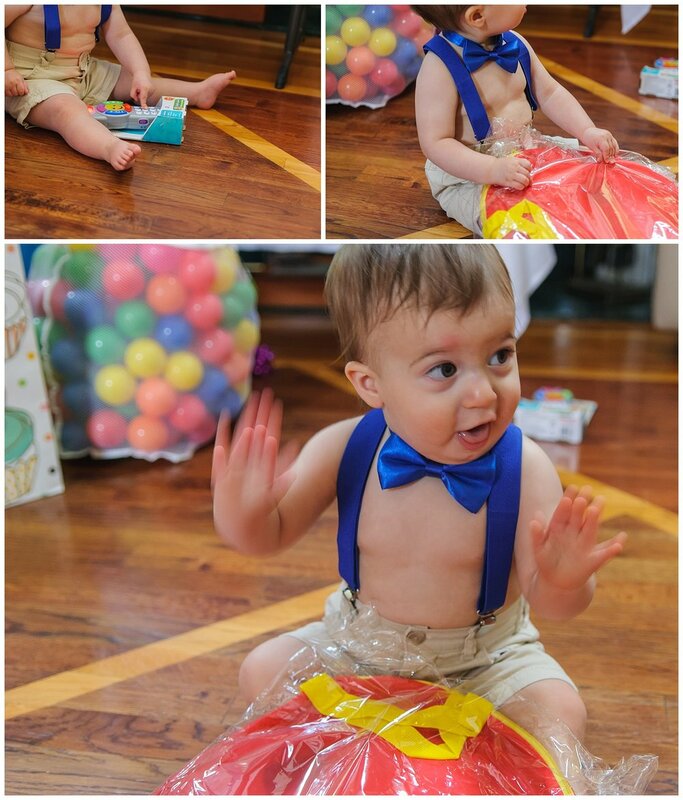 This time around we were celebrating him turning 9 months and what better way than to have a summer theme. We went to a nearby park with a pretty lake and it was perfect! You can't really have a summer photo shoot at a park like this without eating something festive. Watermelon for the win! I will also say that these overalls brought this whole summer theme family session together. 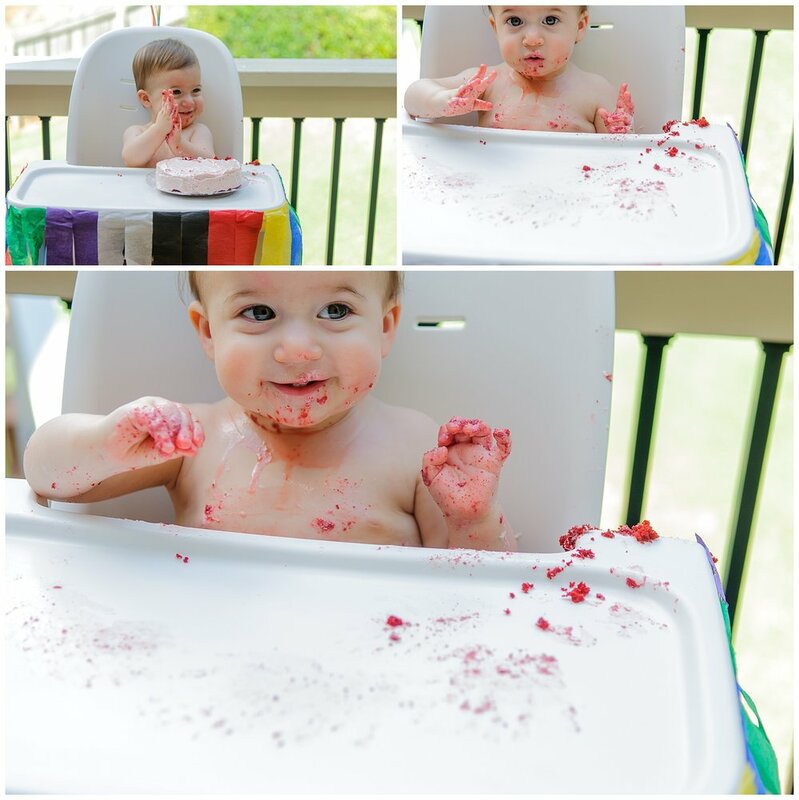 I hope you enjoy these photos of this guy snuggling with Mom and Dad and eating watermelon as much as I do and I am looking forward to seeing him when he turns the big O-N-E! If you are interested in booking a lifestyle family session, head on over to my contact page to learn about me and send me a message. Can't wait to hear from you! Lifestyle photography does not always mean that we have to have our session inside but in this particular case I was happy to offer it in their home. 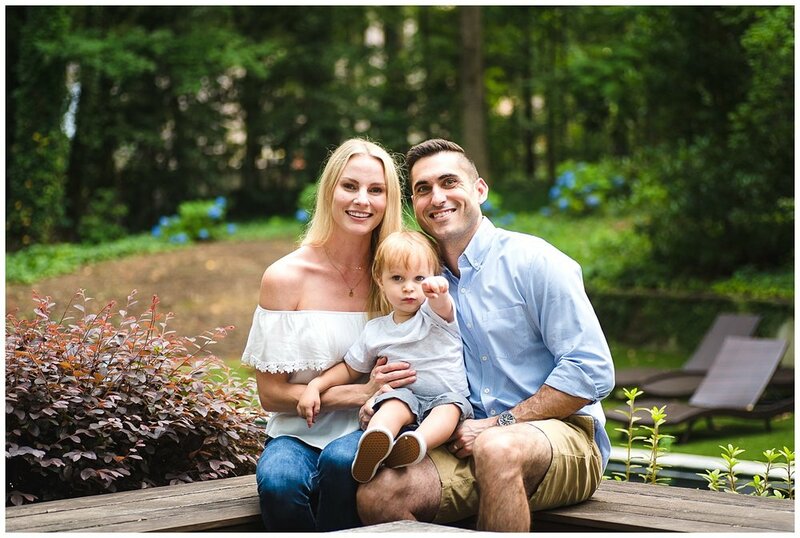 I feel that we got so many great shots of this beautiful family and I was happy to have their home as the location of the session. Home is the perfect backdrop for your lifestyle family session. There is something about being in in your natural space that makes it feel more personal and intimate. I met this wonderful photographer Dadiana and had so much time with her and her beautiful family! My goal as a lifestyle family photographer is to capture connection in a genuine and comfortable way. With children being different ages, there are several ways to make this connection happen. The little girls in this family are quite young so naturally we had a little tickle fight. Tickles can be such a fun activity that brings out natural smiles and expressions from the little ones. I thought it was adorable that the little one had ways to steal the show with her fresh expressions! I think getting group shots of the family is important and we try to get those out of the way at the beginning of the session, but the rest of the time we really just carry on and I'm there to capture the connection. The two girls loved jumping on the couch and you can see they have such a loving little friendship already. One of their activities with Dad is to pretend he is a slide and take over. How fun! (Sorry Dad!). Lastly I spent a few minutes getting some shots of just Mom and Dad together. Aren't they the cutest? 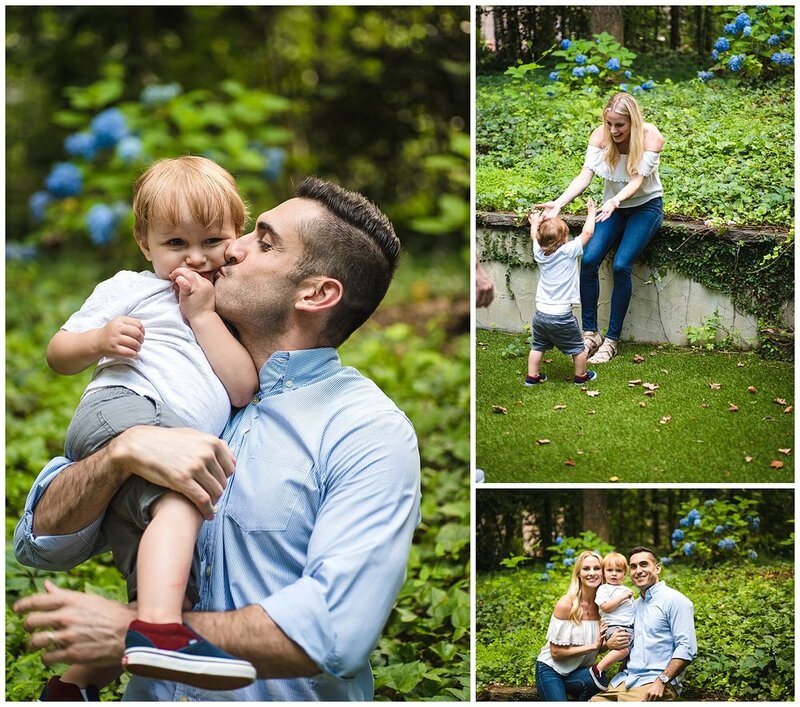 Check out another recent lifestyle family session on the blog. I loved incorporating this little guy's interest and love for chalk! If you're interested in booking a lifestyle family session with me or if you have any questions, head on over to my contact and faq pages. I'd love to be your family photographer!